Over time Facebook users have been looking for a suitable answer to the above question. Hence, we have taken the time to compile this post to show the necessary steps you need to heed to determine how you can view who follows you on Facebook. 5. Now, you'll need to select Friends or Public next to Who Can Follow Me. 4. From the drop-down menu, click "Following"
5. On performing step 4 above, the list of all your followers will appear. If you don't have any followers on Facebook, you won't see this option. Mind you that you need to allow people to follow you before you can see this Facebook feature. According to the Facebook Help Center, if you let people who aren't your friends follow you, people who send friend requests that you ignore or delete will automatically start following you. However, peradventure you don't want someone to follow you, you can block them at any time. You can click here to see how to block people on Facebook Apps. 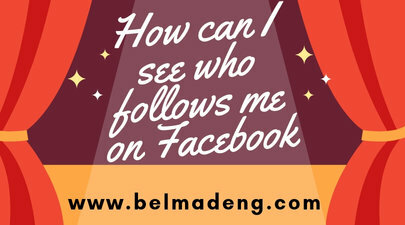 Please share "How can I see who follows me on Facebook" with your friends...Thanks!! !